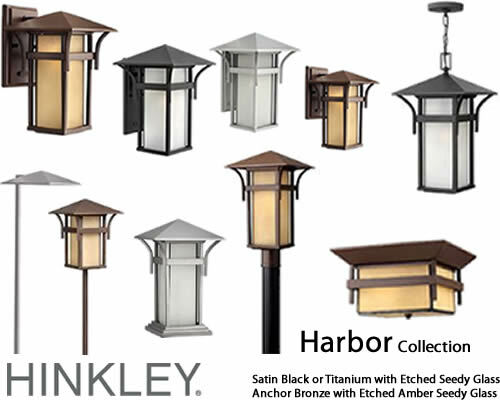 The Mission Style Harbor Collection from Hinkley Lighting has an updated nautical feel, with a style inspired by the clean, strong lines of a welcoming lighthouse. 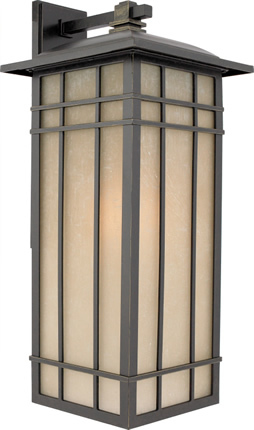 The cast aluminum and brass construction is accented by bold stripes against the seedy glass. 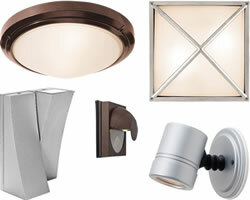 Available in Medium base, GU24 or LED. 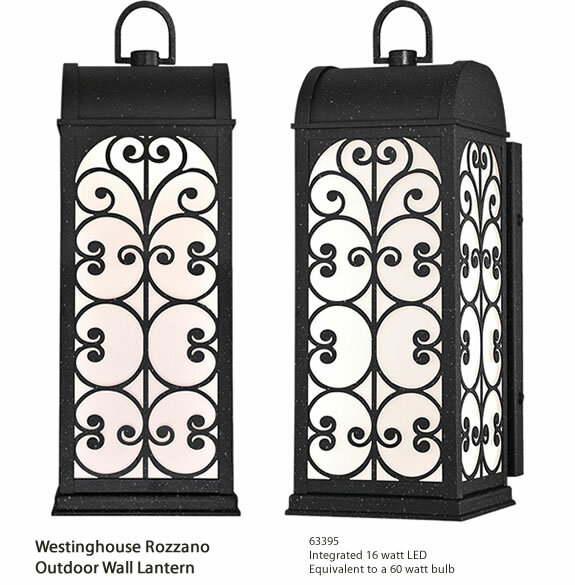 Width 5.43" x Height 16.06"
Back Plate: Height 11.02" x Width 5.35"
Height from Center of Outlet Box 9.69"
Make a statement with the tastefully embellished Rozzano LED outdoor wall fixture. 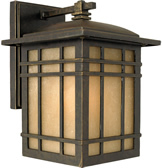 Inspired by tabletop candle lanterns, it features elegant scrollwork in a textured iron finish. 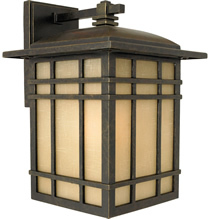 Add this wall fixture and easily create a warm welcome and beautiful illumination outside your home. 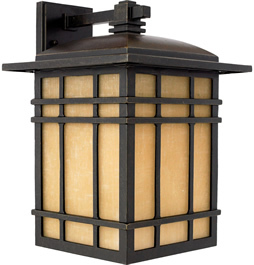 The Rozzano wall lantern features energy-efficient integrated LED technology, that provides long-lasting, maintenance-free lighting, and cost saving benefits. A classic geometric Arts and Crafts piece with handcrafted art glass in shades of sapphire blue, warm honey, amber and cream. 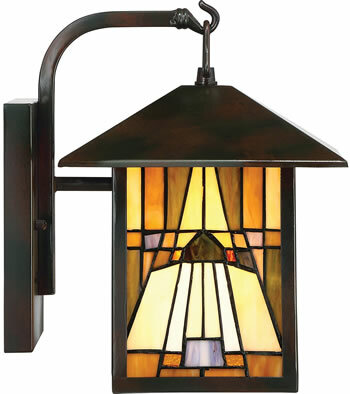 Arts and Crafts is an enduring style that honors the tradition of fine craftsmanship and attention to detail.Glass color in Tiffany lighting products vary in color. No two pieces are identical. 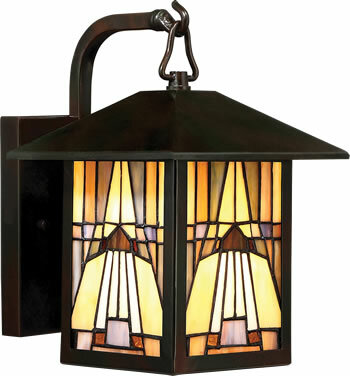 Glass color in Tiffany lighting products vary in color. No two pieces are identical. A classic geometric Arts & Crafts piece with handcrafted art glass in shades of sapphire blue warm honey amber and cream. 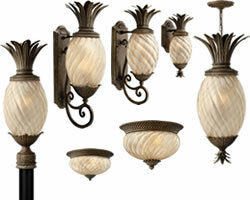 Arts and Crafts is an enduring style that honors the tradition of fine craftsmanship and attention to detail. 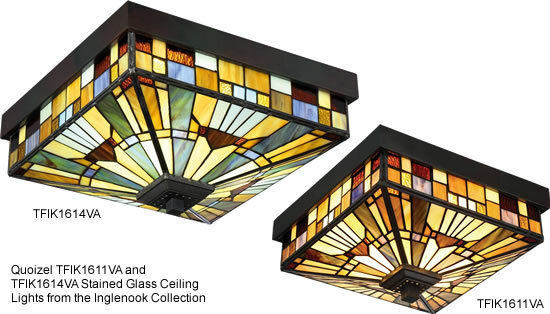 Glass color in Tiffany lighting products vary in color. No two pieces are identical. Width	5" x Height	7"
Width	7" x Height	11.5"
Height from center of Wall opening 3"
Width	9" x Height	14"
Height from center of Wall opening 3.5"
Width	7" x Height	15"
Width	9" x Height	12.25"
Width	11.25" x Height	6.25"
Width	25" x Height	17"
Overall Height	55", Stem:	36", Canopy: 5"
The Alameda Collection brings its simple, down-to-earth design to your outer decor adding an unassuming dynamic to your home's profile. 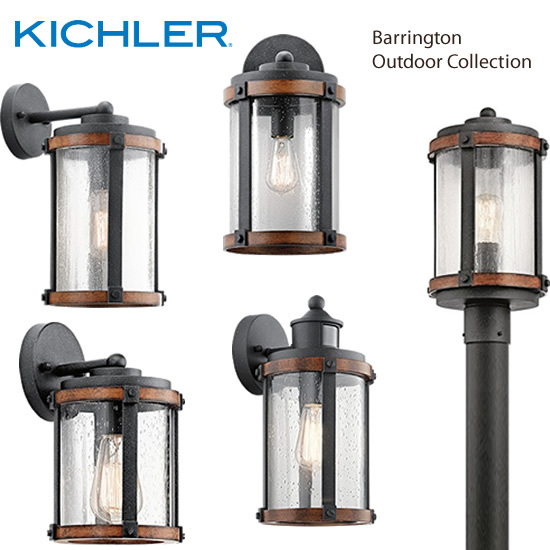 Each fixture utilizes a classic lantern shape. 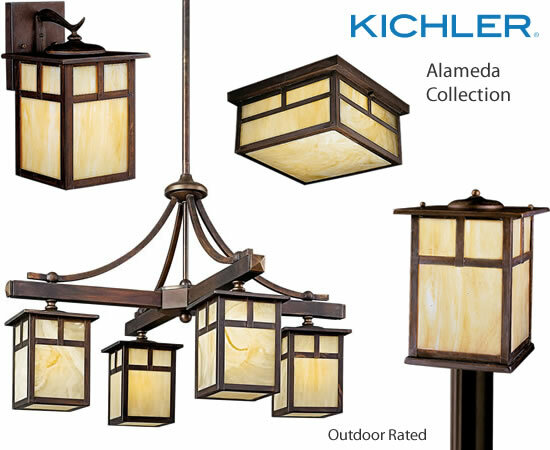 Canyon View finish and Honey opalescent glass panels, add instant beauty and ambiance, making the Alameda Collection a family of outdoor fixtures that garners attention wherever you install it. Dimensions: 9" Height x 6" W, 7" Ext. 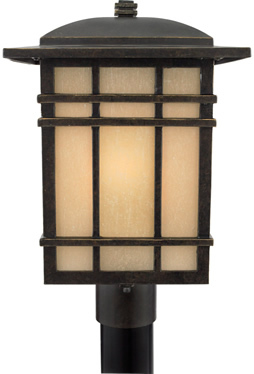 A design made for classic Arts & Crafts style homes, but looks great on contemporary or modern homes as well. The opaque linen glass softens the light, reducing glare and hot spots. Dimensions: 10" Height x 7" W, 8" Ext. 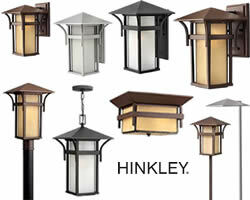 The Fluorescent version lowers your energy consumption by using flourencent bulbs, and by having a photocell that automatically turns the light off during daylight hours. Meets Title 24 requirements. 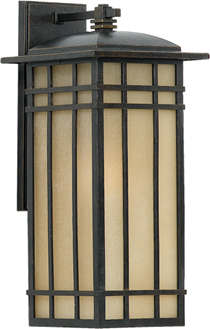 Dimensions: 13" Height x 9" W, 10" Ext. Shade: 9" x 6 1/2"
Dimensions: 20" Height x 9" W, 10" Ext. 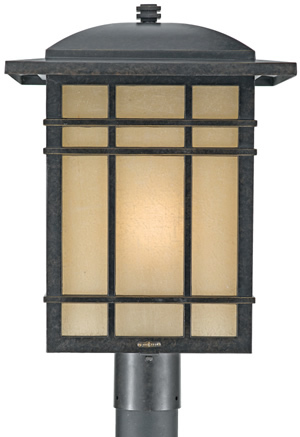 Shade: 6 1/2" x 16"
Dimensions: 15 1/2" Height x 11" W, 12" Ext. 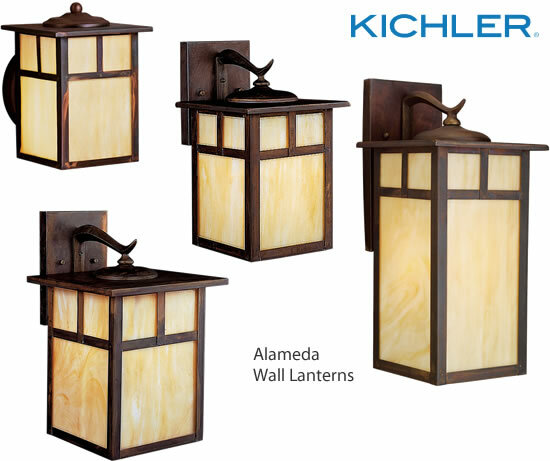 Shade: 11" x 7 1/2"
Dimensions: 25 1/2" Height x 11" W, 12" Ext. 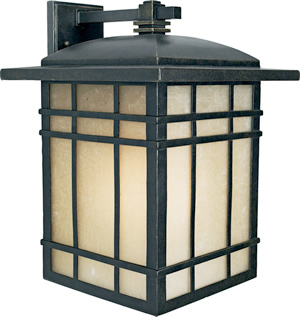 Dimensions: 17 1/2" Height x 13" W, 14" Ext. Shade: 9 1/2" x 13"